The underlying data for this post are available for download. Download the Supporting Effective Instruction (SEI) grants funding by congressional district or by K-12 school district. Special thanks to Budget Center Senior Policy Analyst Sara Kimberlin for her assistance in preparing these data sets. As we blogged about recently, President Trump’s budget blueprint for federal “discretionary” spending proposes significant cuts to a range of key public systems and services. While this so-called “skinny budget” lacks important details, it calls for eliminating two K-12 education programs and, by doing so, would reduce the funding available to every California school district as well as to many community-based organizations across the state. California is estimated to receive more than $365 million for these two programs in federal fiscal year (FFY) 2017, which began October 1, 2016: $252 million for Supporting Effective Instruction (SEI) State Grants (also known as “Title II, Part A” funds), which aim in part to increase the number of educators and advance their quality and effectiveness; and $114 million for the 21st Century Community Learning Centers program, which supports before- and after-school as well as summer school programs. Although these two federal funding streams represent just a fraction of the $74.5 billion overall that is budgeted for K-12 education in California in 2016-17 (the state fiscal year that began July 1, 2016), their elimination would disproportionately affect students from low-income families because dollars for these programs are targeted to these learners. A closer look at the SEI State Grants helps show why. Federal funding for SEI grants provides California with more dollars than does any other federal K-12 program aside from grants for special education and Title I funds, which support students from low-income families. SEI grants are provided to states based on a formula weighted toward the number of students living in poverty. As a result, nearly half (47 percent) of Title II, Part A dollars in 2015-16 were allocated to the highest-poverty districts in the nation, according to a US Department of Education (USDOE) survey. What’s more, changes to the allocation of SEI dollars, made by the Every Student Succeeds Act of 2015, will increase the proportion of funds provided for children in poverty starting in FFY 2018. This all means that the Trump administration’s proposal to eliminate the SEI grants would cut funding specifically intended to help students most in need. The USDOE survey also shows that more than one-third (35 percent) of school districts use SEI dollars to hire teachers and reduce class sizes. This strongly suggests that the Trump administration’s proposal would eliminate funds that help mitigate California’s worsening teacher shortage crisis — a shortage that disproportionately affects school districts with large shares of students from low-income families. And the fact that, nationwide, nearly half (45 percent) of teachers paid with SEI dollars to reduce class sizes are in the highest-poverty districts means that disadvantaged students are likely to be hurt substantially by ending the SEI grants. Among congressional districts that are in the “top third” (the top 18 of all 53 California congressional districts) in terms of losing the most SEI dollars, half are in the San Joaquin Valley or other inland parts of the state. In addition to these nine districts — 1 (R-LaMalfa), 3 (D-Garamendi), 8 (R-Cook), 9 (D-McNerney), 16 (D-Costa), 21 (R-Valadao), 22 (R-Nunes), 23 (R-McCarthy), and 51 (D-Vargas) — eight congressional districts in the Los Angeles area and one in San Diego would lose the most SEI dollars. 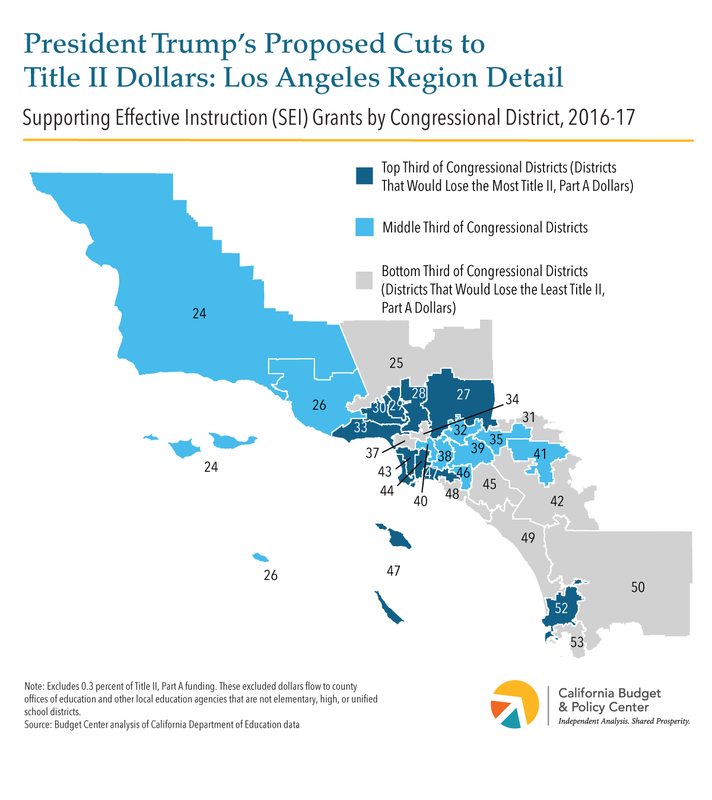 Among the one-third of congressional districts that would lose the least SEI dollars, nearly half are in the Bay Area, the Sacramento Valley, or further up the northern California coast. In addition to these eight districts — 2 (D-Huffman), 7 (D-Bera), 11 (D-DeSaulnier), 12 (D-Pelosi), 14 (D-Speier), 15 (D-Swalwell), 17 (D-Khanna), 18 (D-Eshoo) — 10 congressional districts located in the Los Angeles region or further down the southern California coast would lose the least SEI dollars. 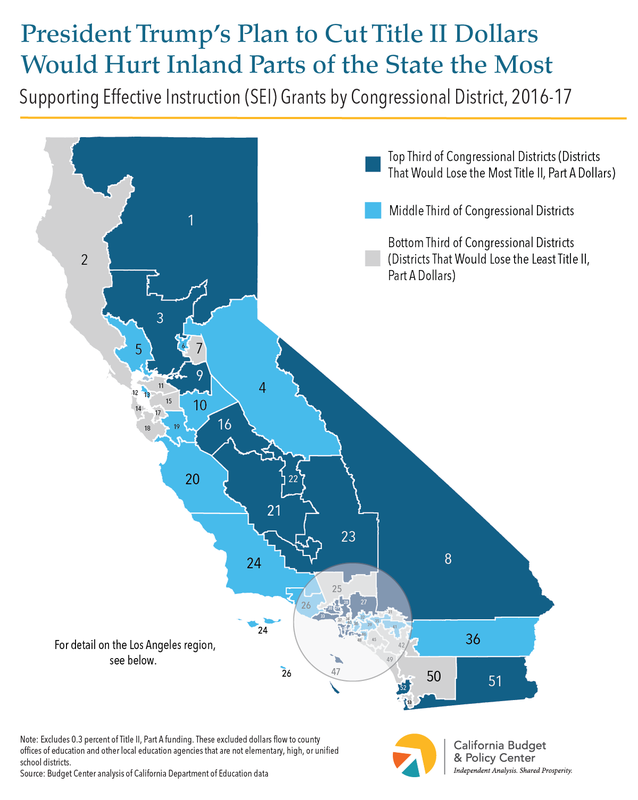 Download SEI grants funding by California congressional district. Download SEI grants funding by California K-12 school district. Although President Trump’s budget blueprint provides only limited details, it does point toward his overall approach to funding K-12 education. That approach includes depriving public schools of federal dollars that can be used to reduce class sizes throughout California. Eliminating funding for these programs will make it even harder for California schools to address growing teacher shortages — and in a cruel irony, cuts to federal funding would be the greatest in many of the same areas of the state where the impact of these shortages are felt the most.